We believe that everyone has a story that needs to be shared. We also believe that it shouldn't be frightening or overwhelming to write that story. At The Write History we are committed to revolutionizing personal history writing so that the family history archives and libraries are filled with all the wonderful stories of people who have lived and contributed to this experience of life. My husband used to sit down about once a year to write his history. He knew it would be valuable to our daughter and her family down the road. But despite being a successful attorney and writer, he never knew where to start with his own story. Every year he would open his computer, stare at the screen, type a few sentences, erase those sentences, write a few more, and then complain that he just didn't know where to begin. After about an hour of frustrated effort he would close the computer with nothing written and not think about it for another year. In 2015, at the age of 46, my husband suddenly and unexpectedly died. He never got his history written down. Much of his life and too many of his experiences will never be known by future generations. What a loss! That is the impetus for this company. Everyone has a story, but most of us don't know where to begin telling it. Writing your history using our system of fill-in-the-blank extended answers is easy. You can be as brief or lengthy as you wish. But while you alone dictate the story and its length, you will always have the roadmap leading you along the path of wonderful storytelling. Never again will you be hampered with the excuse of not knowing where to start. Jonia Broderick has been a writer since she was a child and would regale her friends and family with her many original stories and poems. 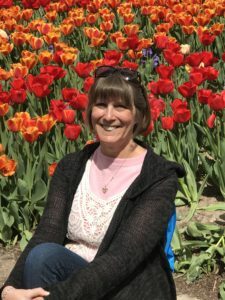 As an adult she changed her writing medium from fiction to non as she became an award winning editor and writer for her college paper before turning her talents to writing for a public relations company. She later worked doing editorial work for a small publishing company. In time she began writing original music that was performed by various singers and musicians throughout the country. Her work as a music teacher allowed her to write programs, scripts, and music for four different school campuses. In 2011 she published her children's book, A Song for Sarah. She has now turned her attention to helping people write their personal histories in memory of her husband, Ben, who passed away in 2015.